Ok, Ok, so I am being a little theatrical here, but there is no doubt that the massive growth of the smart phone and tablets has seen a growing differential between the number of searches done on the desktop computer and mobile devices. With this in mind it is important that if you have any type of business online or offline, then you must have a mobile marketing strategy. Ensuring that your website can be viewed easily on a mobile phone as well as a desktop computer makes sure that you are ahead of your competitors, giving you the edge. Text message marketing has been around for a long time and the drop in the price of setting up and running mobile messaging campaigns has made it more popular allowing small and medium businesses to take advantage of this very successful marketing method. As mobile internet speeds have increased, so has the amount of time that people spend online, searching and even buying products and services. Smart phones are now outselling standard phones by 5 to 1 and anyone ignoring these numbers will lose out in the near future, to those that take advantage of these numbers now. Just think of how you, your friends and other members of your family use your mobile phones these days. We carry them with us 24/7 rarely do we switch them off. Here are some of the most recent figures. 66% use mobile search while watching TV, something which should get advertisers thinking. 61% said they use it at work. 75% said mobile search makes their lives easier. 63% said access to mobile search has changed the way they gather information. 32% said they use Mobile search more than search engines on their computers. 84% use mobile search to look for information on local retailers, such as opening hours, address and contact details. 82% look for online retailers. 73% find a specific product or manufacturer website. 68% use it to find the best price for a product. 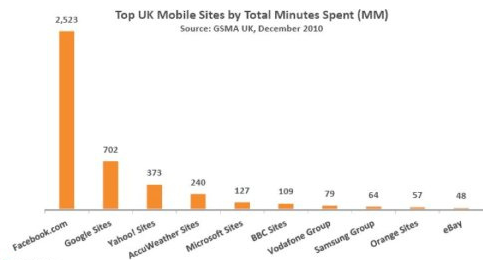 You can also see from the chart below that people spend 4 times the amount of time on facebook than that of google sites. This does not mean that they get 4 times more visits but those that do visit stay on the site for far longer than on others. This is impressive when you compare that to the bbc.co.uk website which is the most popular news sites in the United Kingdom. Also look how facebook compares to ebay and you get an idea of just how popular they really are. So, the message is simple. Make sure that you think carefully about how you move forward with your marketing and ensure that you embrace the mobile marketing opportunities that are available to you. I will be providing more in depth reports on each aspect of mobile marketing in the near future here and on my new website www.localbusinessbuilder.co.uk which is being built as I type. The design is not finished neither is the content but take a look and let me know what you think. I would appreciate the feedback from you.